Black is one of the most favorite and alluring hair tones. Some were blessed naturally with this hair tone, others decided to sacrifice their initial color for a splendid dark shade. It's time to perk up plain hairdos with the latest trends in hair highlights. These chic accessories will offer beauty-conscious people the chance to add a refined and funky flair to their look. 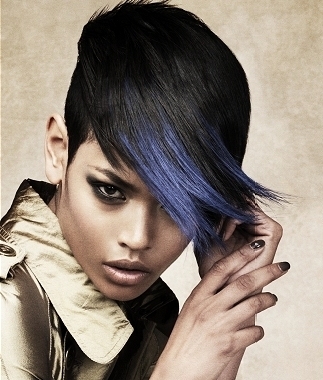 Skim through the black hair highlight ideas below for some inspiration. It is a common misconception that black colored strands will give a monotonous look to our appearance. It seems that professionals managed to come up with some revolutionary ideas of black hair highlights to cheer up a plain look. There's no need to sacrifice extra-strands or dive into the depth of hair styling in order to benefit from these chic accessories. Regardless of sporting short, medium or super-long hair, highlights will create an immediate and smashing result. For the desired 'wow' effect make sure you complete the pre-planning phase which would require the selection of the ideal shades and hair highlighting techniques. If you play your own game and wish to skip the help of professionals, follow the basic hair coloring guidelines precisely. On the other hand, those who contact a high brow hair salon should ask for the additional advice of stylists who'll furnish them with the multitude of options to choose from. The next step in perfecting the style is the proper pairing of highlights with the texture of the hair. Creating a dramatic effect is best done through using large chunky highlights that cover the sides or the crown of the head. A similar hair style can be adopted both by those who long for a tint of change as well as by those who are fond of alternative hair styles as Emo or Scene. 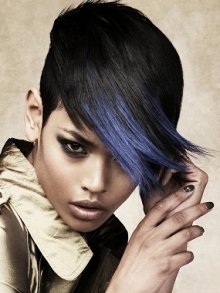 Similar hair dyeing ideas will complement all hair textures. Appeal to similar techniques both if you own angel-curls as well as when sporting super-sleek cascading strands. During the coloring process make sure to cover the desired section with a uniform layer of hair dye to preserve the polished look of your stylish hairdo. Both vivid and radiating shades as red and green as well as purple seem to perfectly flatter black and generally dark hair tones. However, those who look for a moderate and class effect should choose brown and brownish streaks that can blend into the overall look still adding a groovy twist to the locks. 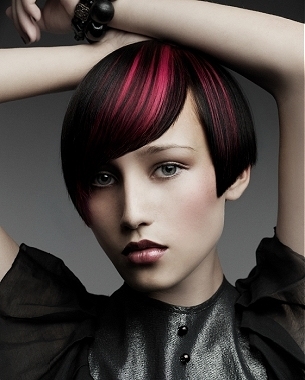 Choose the color combination and the width of highlights according to your skin tone and personal style. There's no need to restrict yourself to one single shade if you have the courage to sport a real chromatic fantasy. The latest trends will furnish you with enough sources for inspiration. 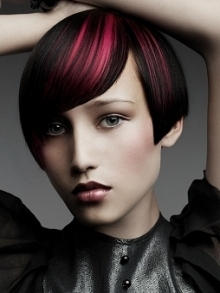 Think on a wider tone palette to offer yourself more options to boost the effect of your hairdo. Use the proper hair styling tools that will help you put all these chic details in spotlight. Opt for a classy hair dressing style for a formal occasion and a more sophisticated one if you are invited to a special event. Juggle with shades and proportions to create a worth-admiring impression in your entourage.